On Saturday, December 2nd from 10 a.m. to 2 p.m., Phelps will be hosting its annual Winter Clothing Sale in collaboration with Stanstead’s youth centre, Le Lounge. 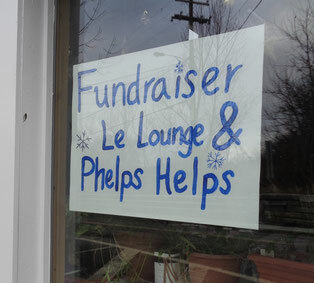 Every year, youth who participate in the Lounge and Phelps come together for this student-led fundraiser. This year, we have extended the range of items for sale to include not only coats, but all types of winter clothing: hats, scarves, mitts, snow pants and boots. The students will also be selling bracelets and Christmas cards that they’ve made, as well as delicious cookies and hot chocolate. We have received a number of quality brand-name coats that we will be selling at a low cost, as well as some older quirkier coats that may be excellent additions to a school’s drama department costume collection. With the money raised, the Lounge would like to purchase a flag-football kit and Phelps would like to invest in several ipad chargers for students who do their homework on their ipads. Come stop by 272 rue Dufferin in Stanstead this Saturday and you may find the perfect little gift for a niece or nephew, or find the coat or scarf you’ve been looking for. Thank you in advance for supporting this local fundraiser!